Powers/Abilities: Vaguely humanoid, the Robot-Men had tentacle-like arms and could function underwater. The Robot-Men acted as mindless drones, while only the leader showed a capacity for independent thought. The extent of their technology is unknown, but the Robot-Men could control magnetic force, which they used to sink cargo ships. (Young Men#24/3 (fb) - BTS) - The Robot-Men arrived on Earth and set up a base in a cavern under the waters of the South Pacific. They began conducting a scientific investigation of Earth in preparation for a mass invasion. (Young Men#24/3 (fb)) - During a violent storm, a ship was pulled magnetically toward a coral reef offshore of a tiny island -- it was smashed to pieces, and all hands were lost. (Young Men#24/3 (fb)) - One week later, on a calm, sunny day, another cargo freighter met a similar fate and sank near the same island. (Young Men#24/3 (fb) - BTS) - Similar incidents happened again and again until a total of six cargo ships sank to the sea bottom. (Young Men#24/3) - Alarmed by the disasters, government and maritime officials re-routed all commercial shipping traffic from the area to keep it away from the island. The navy sent an investigating team to the area, and a diver who explored the wrecks found the ships stripped to the bulkheads, their cargo holds empty, and all the radio, radar, and navigation equipment gone. Betty Dean read a news report of these events and contacted her friend Namor. The two flew by plane and parachuted to the island, where they found villages pillaged and burned and all the natives killed. 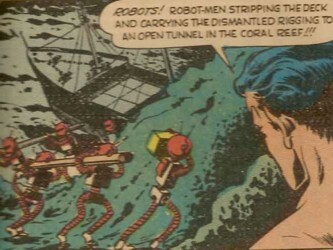 While exploring one of the wrecks undersea, the Sub-Mariner saw a group of Robot-Men stripping the deck and carrying the dismantled rigging to a tunnel in the coral reef. Namor swam ashore to warn Betty and report his findings. Betty radioed the navy and told them the story, but they only laughed her off. Determined to find some answers, Namor returned to the sea. The Sub-Mariner swam back to the Robot Men and easily destroyed two of them, but seeing that they were only mindless slaves, Namor wanted to find the mastermind behind the scheme. 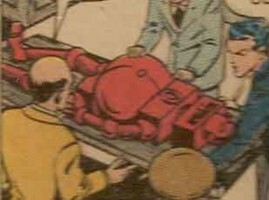 As another robot struck him with a glancing blow, Namor went limp and feigned unconsciousness. 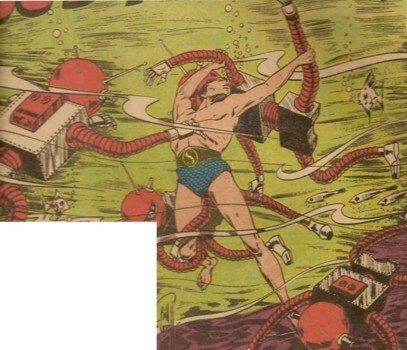 The remaining Robot-Men carried the Sub-Mariner to their leader in the undersea cavern. Standing before the Robot-Men's leader, Namor heard of the leader's plans for conquest of the planet, so he broke free and swam back to one of the wrecked ships. The Sub-Mariner overturned the vessel and poured the coal that once fueled it into the cavern tunnel, sealing the Robot-Men in their base. Namor then dug a narrow hole in the mound of coal and ordered the robot invaders to surrender. After offering some resistance, the robot leader finally surrendered and was marched ashore by Namor. Moments later, a giant geyser leapt skyward from the ocean's depths with a deafening roar, and the robot leader collapsed as its electronic controls went completely dead. The deactivated robot leader was taken to America for study, but authorities found Betty and Namor's account of the adventure to be preposterous. Forty-eight hours later, Namor and Betty accompanied an exploratory team back to the island. A diver reported nothing on the reef but the six wrecked ships and a large hole on the ocean floor. With no definite answers to the mystery, Namor could only conclude: "Earth is safe again...for a while, at least!" Comments: Created by Bill Everett (writer and artist). 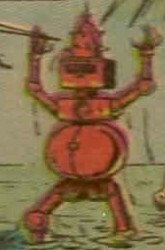 Since there are no known hostile life-forms inhabiting the planet Venus, it's possible that the Robot-Men actually came from another star system and were only using Venus as a base (much like the Kronans/"Stone Men from Saturn")...maybe they were even built by the same aliens who built the Servo-Robot. It sat beneath the sea and ordered the other Robot-Men to scavenge the cargo ships that they wrecked. While the Robot-Men were only its mindless drones, the leader showed signs of having a free will. When the Sub-Mariner buried the Robot-Men in their base, the leader concluded that their plans for conquest were over, so it surrendered to Namor and allowed itself to be marched ashore; shortly thereafter, the Robot-Men's leader deactivated and collapsed. It was later taken to America and left with government scientists to study.